Peter Hobden has done it again! 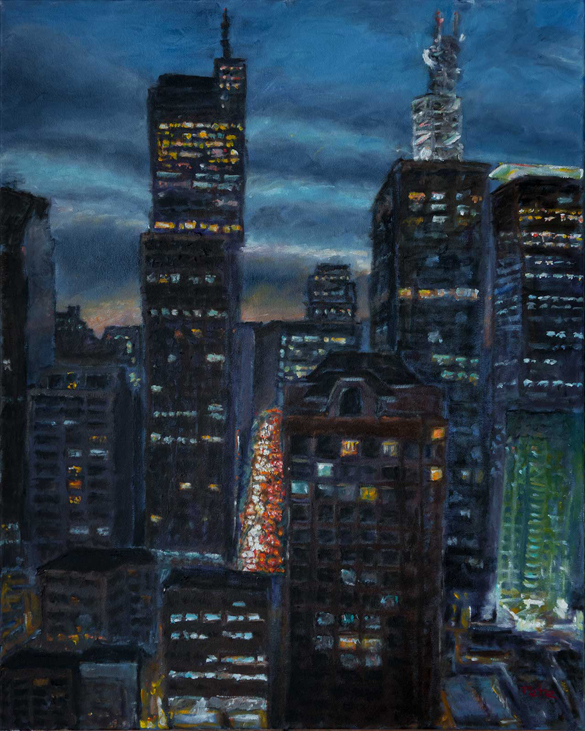 Last week, we featured Peter Hobden’s cityscapes. 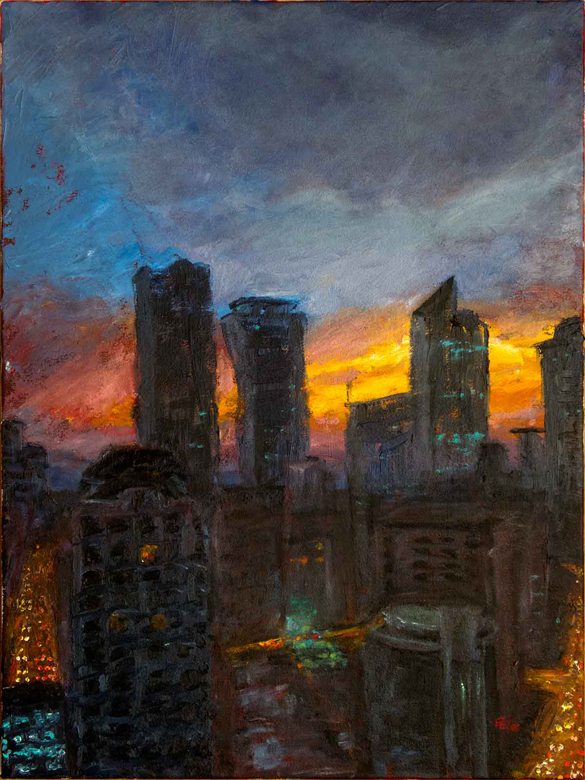 At present, he lives in Manila and has sent us two of his latest: both 60cm x 50cm oil on canvas. He’s done it again: gorgeous colours and big city atmosphere! Peter Hobden has a quiet demeanour. He speaks little of his important work in computing or of his expertise in digital photography. Early retirement allows him to widen his horizons further. He takes up painting in 2007 under the demanding tutelage of Hélène Burgi. 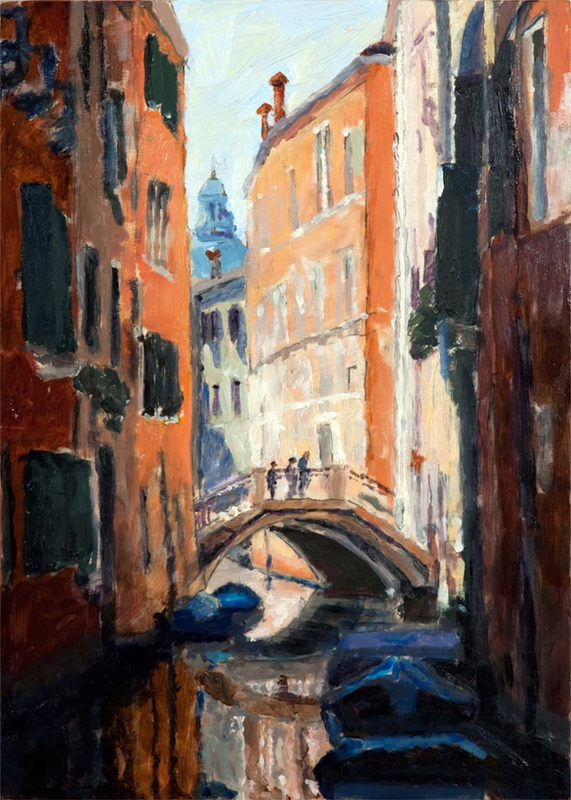 In short time, he develops and masters the loose and relaxed brushstrokes in bold oil colours that become his trademark technique. One would assume he would focus on the natural world but, surprisingly, his forte is the cityscape. On medium-size canvases, his style and chosen theme merge to great effect. The result is atmosphere. In 2010, I visit Peter’s studio in Geneva shortly after he and his wife Sophie return from a trip to Italy. He shows me a canal scene in Venice. I fall for it and buy it immediately. But Sophie can’t bear to see Peter’s pictures leave the studio. It is as though a part of him is also disappearing. His technique advances. The #TwitterArtExhibit stipulates a post-card size work. 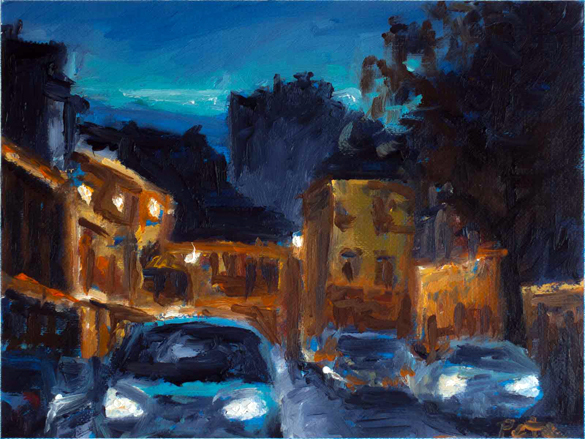 Peter’s entry in 2012 is a delightful 16cm x 12cm dash of oil on card creating an evening street scene in Carouge, Geneva. Peter’s work has evolved rapidly. This evolution is unlikely to stop now. Perhaps in the near future, Talking Beautiful Stuff will blog about Peter reaching back to expertise in other domains to master digital painting. Then his work doesn’t have to leave the studio!